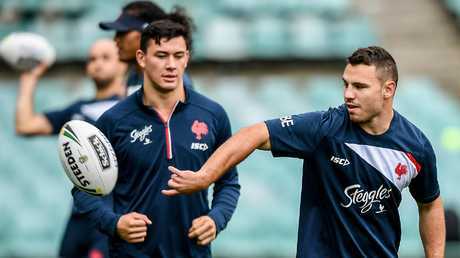 SYDNEY Roosters halfback Cooper Cronk remains in enormous doubt to take part in the NRL grand final having played no part in Saturday's captain's run. The star playmaker appeared at long odds leading into the final session before the decider, but would now seem next to no chance of playing in Sunday's clash with Melbourne at ANZ Stadium. Channel Seven's Facebook coverage of the session showed Cronk standing around with water bottle in hand, failing to play a role in the run. 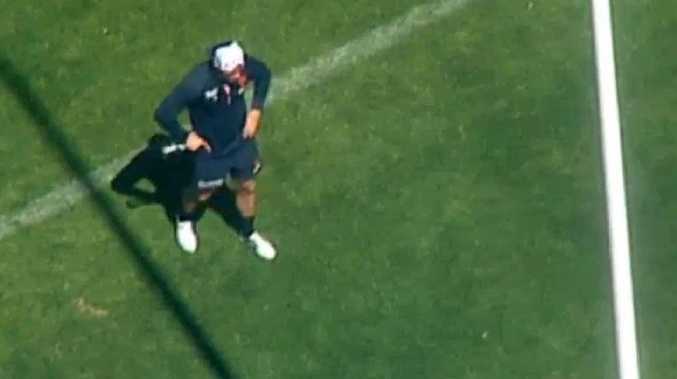 The camera followed Cronk throughout the session from a helicopter above, with the half using only his right hand to catch and pass footballs. It's also understood young halfback Sean O'Sullivan has been told he won't replace Cronk if the former Storm playmaker is ruled out. O'Sullivan made his NRL debut in round 18 for the Roosters against the Titans before failing to take the field in three additional appearances off the bench. Mitchell Aubusson, who was named at seven on Tuesday, and Ryan Matterson appear to be frontrunners to partner Luke Keary in the halves on game day. Despite being an exceptional utility, Aubusson hasn't played in the halves for the Roosters all season and would be a surprise option on Sunday. Matterson has firmed for the role having been coach Trent Robinson's regular replacement in the halves throughout 2018. 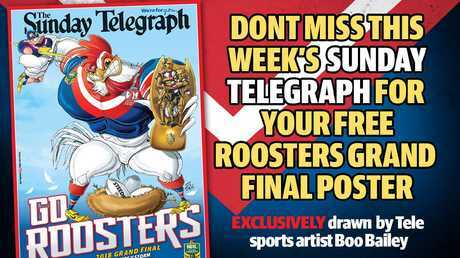 Should Robinson opt for Matterson or Aubusson, five-eighth Keary will face additional pressure to steer the Roosters around the park. The Roosters name a trimmed 19-strong squad on Saturday night but a final verdict on Cronk is not expected until an hour before kick-off on Sunday. However, that has not stopped experts weighing in on whether self-proclaimed "long shot" Cronk will run out against his former club Melbourne at ANZ Stadium this weekend. And while a chorus of greats such as Johnathan Thurston have dismissed Cronk's chances, ex-Roosters half Jamie Soward reckons the signs are good the No.7 will play. "I am adamant he will play. I haven't changed my feeling all week," Soward told Fox Sports. "At the media conference on Friday, if it was that bad he would have had it in a sling and protecting it at all costs. "I just think it is too big a game and he can defend on the edge and they will just change their defensive structures a little bit." premium_icon Out of the sling: Can Cronk pull off injury miracle?